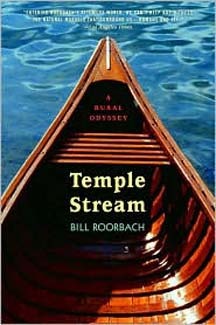 I read Bill Roorbach’s memoir Temple Stream: A Rural Odyssey a couple times last summer. I’d been impressed with his review of my memoir for a prospective publisher, and hired him to line-edit a draft of it. 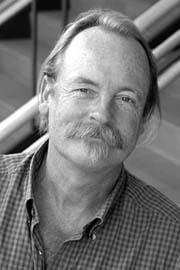 Bill is a novelist, an award-winning short story writer, an essayist, the author of a popular how-to book, Writing Life Stories, the editor of a creative nonfiction anthology, and most recently a blogger. On my first readings of Temple Stream, I don’t remember consciously noticing what really jumped out at me on my recent third reading, probably because not long ago I’d noticed he does it on his blog: an unusual sentence construction, sometimes technically ungrammatical, that’s wonderfully visual, poetic, and colloquial. I may steal it, if I can, to enliven my own prose. On the one hand, this is just hanging a strong adjective off the end: “He fell back, wounded” is an example. But Bill tweaks it. This literally says leaves (the subject) were forlorn, but placed next to “road” the word implies the road was forlorn, too—achieving the effect of typing the entire scene: the effect of the leaves blowing down the empty road was forlorn. That elaboration is perfectly clear, but twice the words and half the poetry of Bill’s sentence. Again, this allows him to end on a strong word, but also to employ an odd, interesting pattern. And I feel the cold pinch keenly. At least one reviewer of Temple Stream on Amazon noted the book’s delightful wordplay—especially the occasional funny unusual word—and this is part of that, higher order stuff. In the first sentence I might reverse it, except the adjectival modifiers placed where they are seem to surmount the fact they’re otherwise inescapably ordinary, and the paired rhythm is nice. Overall I like this emphasis placement better than poet Mary Karr’s striking construction that appears occasionally in her recent memoir Lit: “Freaked, he was,” to make up a likely example; anyway, hers often stopped me. But Bill doesn’t over-use his pet—not much more in the 300-page Temple Stream than I’ve culled here for the blog—and his construction probably devolved from poetry, too, come to think of it. Even the writer of prose had better be after poetry. As an aside, I always admire writers who use intentional comma splices well, even if I seem unable to bring myself to do it—partly out of craven conformity, no doubt, and partly because I’m so hard on students who splice unknowingly. Oddly, in that same book review noted above, in a piece on the novel Seven Years, the reviewer said that its “conscientious translations even maintain the comma splices that occur regularly in German but appear as grammatical errors in English . . .” Who knew the Germans merely spliced anything? Fascinating. I love Roorbach, through and through. Maybe I will, too, retired wannabe. Cool. The Transferred Epithet sounds like a it should be a book title . . . or a darn good cafe. I agree. I love that term. Thanks Richard. I found this fascinating, though possibly inhibiting going forward! Some of that syntax I invented for the book, additive sentences tumbling downhill through rocks and sweepers and snags and oxbows, seeking sea level, sea level, tracing the thalweg. And a little bit of Gertrude B. Stein. Grammar is the writer’s dominion, by the way, and it’s up to others to find a new rule to explain what’s happened if what’s happened is pleasing. Language lives! I don’t know about a new rule for what Roorbach artfully does with words and clauses and punctuation. The ancients named it amplification (auxesis), which has a long list of rhetorical figures, schemes, and strategies. I see a few of them in the above examples and more in what other Roorbach I’ve read. Intuitive, sure; mastery, yeah; accessible, yep; delicious, yes. So many trails to follow after reading this post. Everything Roorbach, for sure. I don’t know much about grammatical construction, but Roorbach’s lyrical voice gets me. I agree, “The Transferred Epithet” sounds like a college campus coffee house; makes me think of how I process what I am really thinking in certain situations to the more socially acceptable sentence that comes out of my mouth. And I would never put you in the category of “craven conformist.” Good grief!